Well, this isn't good. Sports Illustrated's parent company, Time Inc., is going to spin off from its very rich corporate overlord, Time Warner. Time Inc.'s 21 magazines—which include SI, Time, People and Entertainment Weekly—will be tossed aside into a new public company. What's that mean? Well, it's gonna make life even more miserable for these magazines. It's a dying industry—as the Times noted, SI's newsstand sales have dropped 46 percent in the last five years—and though Time Inc. still has revenue in the billions and profits in the hundreds of millions, there won't be a big, rich sugar daddy to take care of these increasingly endangered titles. 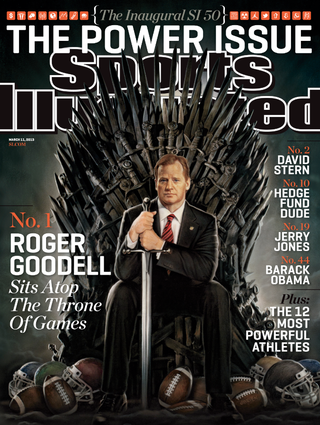 Now SI will have to answer to cranky shareholders who won't be distracted by HBO's and Warner Bros.'s huge profits. As of a few days ago, SI was one of the four magazines that was actually expected to be protected from all of this. Time Warner was set to banish most of its magazines into a new company, but hold onto SI, Time, Fortune and Money since they're all legacy titles and they'd play well on CNN. But, according to the Times, Time Warner executives changed their minds after they "grew increasingly concerned over the future" of those four magazines. Eep. SI has been hit especially hard in recent years. Its revenue in the last five years has dropped dramatically. It used to be the second-best earner at the company (next to the magazine world's most profitable mag, People) but in just a few years it's fallen to somewhere in the middle of the pack at Time Inc., a well-placed source told me. The new company—which will be public—will only add the stress. There'll be an even closer examination of SI's spending, expenses and the rest. All newsweeklies are going to be a smaller version of themselves in a few years, but this decision will only accelerate the timeline for SI. As for Time Warner? Congratulations. We've seen hints of it coming, but Bleacher Report is now officially your flagship sports news outfit. Whatta world.